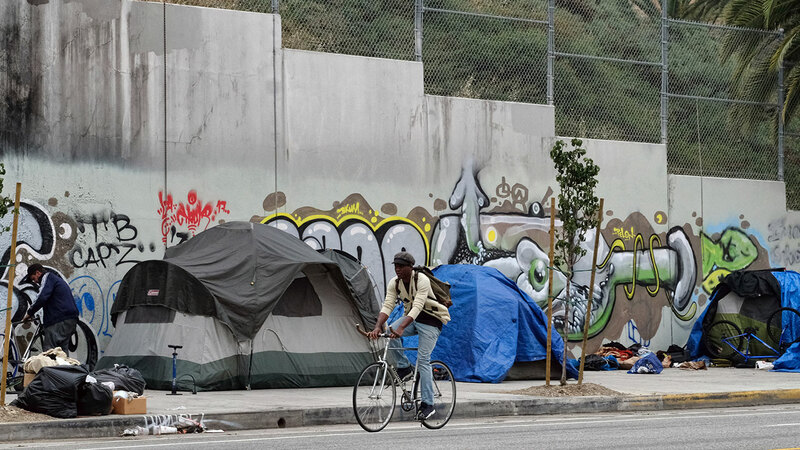 A cyclists rides past a homeless encampment alongside a street in downtown Los Angles on Wednesday, May 31, 2017. LOS ANGELES (KABC) -- Many residents will tell you that increasing rent prices in Los Angeles are making things tough. There's a new finding by the real estate website Zillow that suggests it's about to get a lot tougher for thousands of people who reside in the city. The research shows that a five percent rent hike in LA County would likely push 2,000 people into homelessness. At the start of 2017, LA County's homeless population was already at more than 61,000. Zillow is forecasting a 4.5 percent rent increase in the LA area for the coming year. Studies have shown that rent increases are closely tied to growing homeless populations in places like LA and New York City, where there's little low-income housing available for people priced out of gentrified neighborhoods. The Los Angeles Homeless Services Authority blamed rent increases for a 26-percent surge in homelessness last year. The agency said more than a quarter of LA residents spend more than 30 percent of their income on housing.